charming personality to match her darling looks. She is 5 years of age and weighs about 67 pounds. lay down next to her and just stare at the blue skies. a free wellness exam at a participating veterinarian. Gabriel Valley Humane Society located at 851 E.
in turn helping prevent animal neglect or abuse. 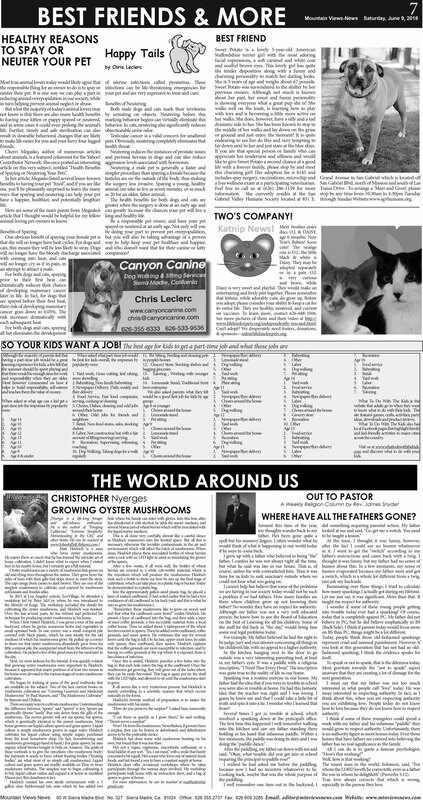 about animals, is a featured columnist for the Yahoo! of Spaying or Neutering Your Pets”. an attempt to attract a male. your pet and are very expensive to treat and cure. aggression levels associated with hormones. as 20 for an older, fatter animal. or in a pair. O.J. on vaccines. To learn more, contact 626-688-3506.
and responsibility when they are older. and teaches them the value of money. ideas, downloads and product reviews. him in his nearby home, but I certainly got a full tutorial. sides of trees with their gills that slope down to meet the stem. cultivating the oyster mushroom, and Heidrich was hooked. technique for producing oyster mushrooms in his home. Mason jars. But cleanliness is key. he demonstrated in a plastic bag. uses to grow his mushrooms.). “I eat them as quickly as I grow them,” he said smiling. seems to be the preferable choice. foods, and he’s found a way to have a constant supply at home. spawn to grow at home. if he were to come back. could not hear what was going on. father? No wonder they have no respect for authority. some real legal problems today. his children’s life, with no appeal to a higher authority. was quite true to the reality of life in our home. involved a spanking down at the principal’s office. because now I had no incentive whatsoever to lie. how many spankings I actually got during my lifetime. taught me respect for authority. on BS than PC, things might be a lot different. To spank or not to spank, that is the dilemma today. father has no real significance in the family. Well, how is that working? the son in whom he delighteth” (Proverbs 3:12). especially in the person they love.